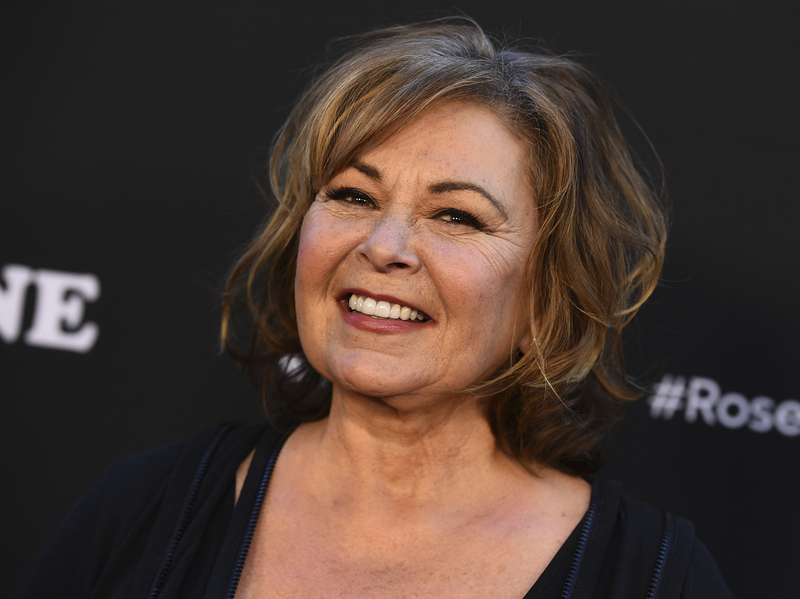 ABC Cancels 'Roseanne' After Racist Twitter Rant From Its Star : The Two-Way The comedian's tweets were "abhorrent, repugnant and inconsistent with our values, and we have decided to cancel her show," the president of ABC Entertainment said. ABC Entertainment said it was canceling Roseanne after what it said were "repugnant" tweets from the show's star, Roseanne Barr, seen here in March. After Roseanne Barr posted a series of incendiary tweets, ABC canceled the reboot of her eponymous sitcom. "Roseanne's Twitter statement is abhorrent, repugnant and inconsistent with our values, and we have decided to cancel her show," said ABC Entertainment President Channing Dungey in a one-sentence statement Tuesday. Robert Iger, chairman and CEO of The Walt Disney Co., which owns ABC, shared Dungey's statement and added, "There was only one thing to do here, and that was the right thing." In a now deleted tweet, Barr wrote of former White House adviser Valerie Jarrett, if "muslim brotherhood & planet of the apes had a baby=vj." Although Barr has long had a controversial Twitter presence, that comment crossed a line. "I apologize to Valerie Jarrett and to all Americans," Barr tweeted Tuesday morning. "I am truly sorry for making a bad joke about her politics and her looks. I should have known better. Forgive me--my joke was in bad taste." Later, after hours of re-tweeting justifications and defenses of her actions written by others, Barr took to Twitter again to say: "Don't feel sorry for me, guys! !-I just want to apologize to the hundreds of people,and wonderful writers (all liberal) and talented actors who lost their jobs on my show due to my stupid tweet." Jarrett herself said, "I'm fine. I'm worried about all the people out there who don't have a circle of friends and followers coming to their defense." She said at a taping of an MSNBC town hall event on racism in America, "I think we have to turn it into a teaching moment." Comedian Wanda Sykes, who had been a consulting producer on the show, tweeted that she would not return to the program. The comment about Jarrett was one in a series of controversial tweets by Barr this week. On Monday, one of her tweets said only "Chelsea Soros Clinton". Chelsea Clinton replied, "Good morning Roseanne - my given middle name is Victoria. I imagine George Soros's nephews are lovely people. I'm just not married to one. I am grateful for the important work @OpenSociety does in the world. Have a great day!" To which Barr replied: "Sorry to have tweeted incorrect info about you! Please forgive me! By the way, George Soros is a nazi who turned in his fellow Jews 2 be murdered in German concentration camps & stole their wealth-were you aware of that? But, we all make mistakes, right Chelsea?" Some conspiracy theorists claim that Soros, the billionaire and left-leaning donor, was a Nazi collaborator or a member of the SS – a rumor that has been debunked. Deadline Hollywood reports that Barr has also been dropped by her agency, ICM Partners. "We are all greatly distressed by the disgraceful and unacceptable tweet from Roseanne Barr this morning," said a memo to company employees, according to the entertainment site. "What she wrote is antithetical to our core values, both as individuals and as an agency. Consequently, we have notified her that we will not represent her. Effective immediately, Roseanne Barr is no longer a client." She signed with the agency in August, Variety reports. Roseanne originally aired from 1988 until 1997, telling the story of the working-class Conner family in Illinois. It was relaunched by ABC in March with much of its original cast, including John Goodman, Laurie Metcalf and Sara Gilbert, in addition to Barr herself. "[I]t was so powerful back then to see episodes about gay people, racism and sexism wrapped up in a sardonic comedy about a working-class family in Illinois. The show was saying that groups once separated by homophobia, racial stereotypes or gender bias had more in common than TV — or society — often acknowledged. "Making Roseanne Conner a passionate Trump supporter in the face of all that — especially when the reboot barely examined why she made the choice — just felt like a cop-out forced by the fact that star Roseanne Barr supports the president in real life." Deggans reports that while the first episode of the reboot drew more than 25 million viewers, the audience shrank as the season went on. The May 15 episode drew 10.7 million viewers that night, according to Nielsen. Gilbert, who was an executive producer on the reboot, tweeted that Barr's comments "are abhorrent and do not reflect the beliefs of our cast and crew or anyone associated with our show. I am disappointed in her actions to say the least." "This is incredibly sad and difficult for all of us," she added, "as we've created a show that we believe in, are proud of, and that audiences love— one that is separate and apart from the opinions and words of one cast member."